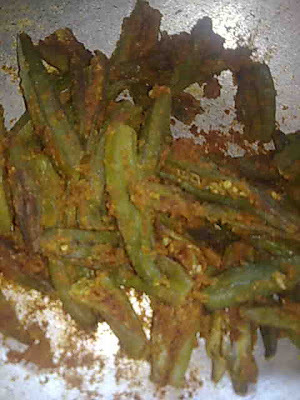 This recipe of bharwa bhindi belongs to Rajasthan where besan and curd are used extensively in cooking. Besanwali or bharwa bhindi's recipe was something I learnt from my mausi (maternal aunt). She is such a wonderful cook. I have learnt some lip smacking delicacies from her which I will be sharing with you in my future posts. 1. Wash bhindi and pat dry on a kitchen towel. Cut off head and tail and slit lengthwise on one side. 2. Take 1/2 tablespoon oil in a pan and roast besan. When besan changes color, add all the spices and roast with besan. Turn off the heat when besan turns red. Let it cool. Add salt. 3. Fill the besan mixture in bhindi. 4. Heat 1 tbsp oil in a pan and add stuffed bhindi. Cover and cook on low heat till cooked. 5. 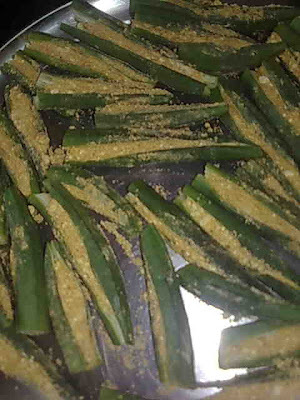 Remove the cover, increase the heat and stir- fry bhindi for some time so they become crisp. Just see to it that they don't get burned. Serve hot with rotis and a bowl of dal to go with it. Healthy Bytes- Bhindi is low in calories and rich in fiber, folic acid and vitamin B6. Fiber in okra helps improve constipation and helps to stabilize blood sugar. Besan or Chickpea flour is an excellent source of protein and also a good source of Iron. 1 cup besan contains 356 Kcal, 53 gm Carbohydrates, 6 gm Fat, 21 gm Protein and 4 mg Iron.